If you want a same day dough, increase the yeast to 1 teaspoon then let rise at least 4 hours or until bubbly looking. It has a less intense flavor but is still delicious. When you want to bake flour a cutting board (we use a flexible one from IKEA) and dump the dough onto it, patting into an approximate lump. Preheat oven to 500 degrees (I do 450 as our oven runs hot) with a dutch oven inside of it. When hot, dump the dough ball into the dutch oven and COVER it (this is important.) Cook about 20 minutes, uncover then cook until golden brown on top. Dump out, cool, slice and enjoy! 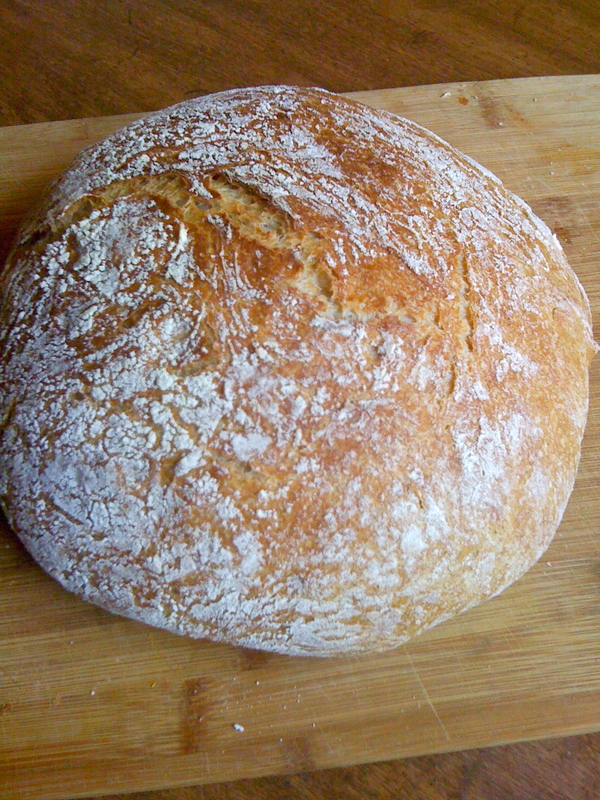 Add some rosemary, garlic & cracked pepper if you want a fantastic savory bread. We bought the Lodge Logic 5-Quart Double Dutch Oven with Skillet Cover – it was comparable in price to others, it’s free shipping on Amazon AND the lid works as its own pan to make amazing cornbread. Or you can use it on the stove top for cooking, though I’ve not tried that yet because we have a cast iron skillet with longer handle. I like that it has the handles on the side vs. the top because it’s easier for me to grab and flip off when cooking ciabatta bread in a 450+ degree oven. We love it, and if we ever go camping we’ll be set for campfire cobbler. Though I did recently make a cobbler in this in the oven – a dump cake variation, it was delicious. Plus extra iron! I was told to cook in cast iron when pregnant and anemic, for all you expecting ladies. This makes 2 dozen muffins or 2 loaves of bread (or half/half) so the amounts look like a lot and that’s why. We don’t split it but I’m sure you could. 1 cup of oil per 2 dozen muffins is one of the lower fat options we’ve found. Mix wet and dry, bake as 2 loaves at 325 degrees for 1 hour or bake as 2 dozen muffins at 375 for 15 minutes. Every combination we do of these turns out a bit different with moisture, rise, etc. It’s a big experiment but always yummy. If you are planning to freeze them then you may want to do full oil – the applesauce/oil ones are drier and seem to not freeze and defrost as well. 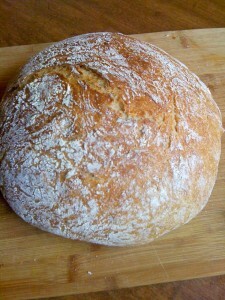 Quick Rise Ciabatta Bread: The Movie! Heidi and C worked up this little instructional video for her quick-rise ciabatta bread. Mix all, cover and let sit 8 to 18 hours or somewhere in there. If you want a same day dough, increase the yeast to 1 teaspoon then let rise at least 2 hours or until bubbly looking. It has a less intense flavor but is still delicious. We bought the Lodge Logic 5-Quart Double Dutch Oven with Skillet Cover – it was comparable in price to others, it’s free shipping on Amazon AND the lid works as its own pan to make yummy, crusty cornbread. Or you can use it on the stove top for cooking, though I’ve not tried that yet because we have a cast iron skillet with longer handle. I like that it has the handles on the side vs. the top because it’s easier for me to grab and flip off when cooking ciabatta bread in a 450+ degree oven. We love it, and if we ever go camping we’ll be set for campfire cobbler. Though I did recently make a cobbler in this in the oven – a dump cake variation, it was delicious. Plus extra iron! I was told to cook in cast iron when pregnant and anemic, for all you expecting ladies. Author kitPosted on August 13, 2011 December 24, 2013 Categories Kids, Projects, Vegan Bread/Breakfast2 Comments on Quick Rise Ciabatta Bread: The Movie!